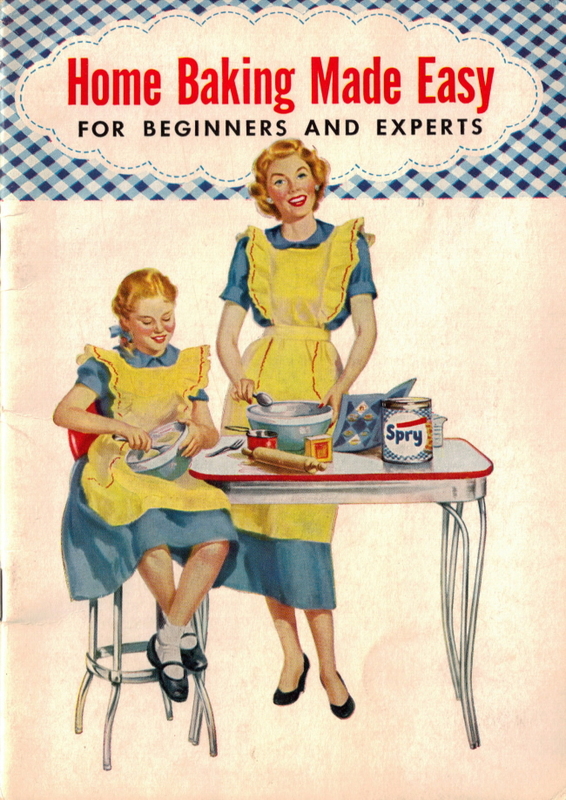 Here is page 14 of the vintage cookbook: Home Baking Made Easy that was published in 1953 by Lever Brothers Company. A moist, fine-textured cake with a rich chocolate flavor. Bake in one pan; serve in squares. Bake in moderate oven (350° F.) 50-60 min. Makes one 8″ x 12″ oblong cake. Cut chocolate very fine and put in mixing bowl. Pour boiling water gradually over chocolate, stirring until melted. Cool. Put flour, sugar, salt, baking powder and soda into flour sifter and sift into chocolate mixture. Drop in Spry. Beat 200 strokes (2 minutes by hand or on mixer at low speed). Scrape bowl and spoon or beater. Add buttermilk, vanilla and eggs and beat 200 strokes (same as before). Pour batter into Sprycoated oblong pan about 8″ x 12″ x 2″. Bake as above. Cool and remove from pan. Spread Carmelscotch Frosting (p. 18) on top and sides of cake. 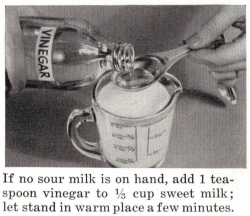 *With a TARTRATE BAKING POWDER, use 1 teaspoon. You can create a tempting variety of luscious cakes with the above basic recipe by baking the batter in pans of different shapes and by using different frostings. PEP’MINT CHOCOLATE CAKE: The same recipe makes two high layers. Combine with peppermint candy frosting for a new taste thrill! Bake in moderate oven (350° F.) 30-40 min. Makes two 8″ round layers. Use recipe for Carmelscotch Chocolate Cake (above). Bake batter in 2 Sprycoated 8″ round layer pans 1 1/2″ deep. Spread Pep’mint Stick Frosting (p. 19) between layers and on top. Decorate top with a narrow border of chocolate curls (p. 5) if desired. FUDGE BAR CAKE: A loaf cake with the same chocolate-y goodness–and luscious nut-fudge frosting. 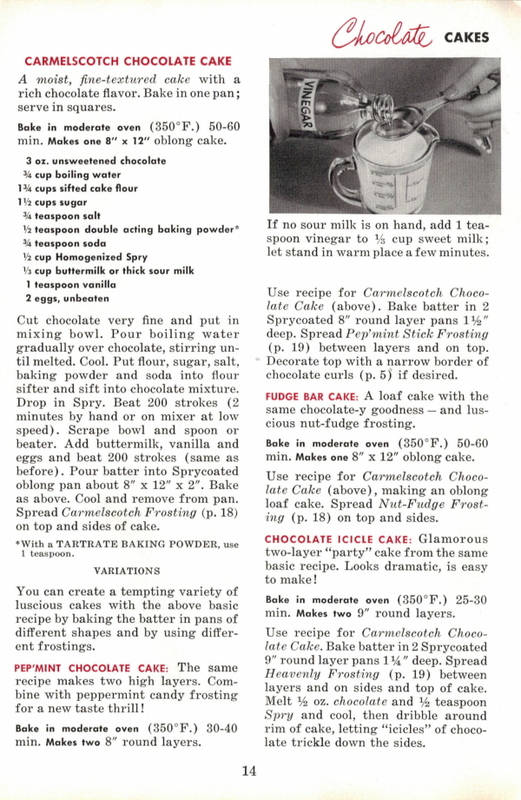 Use recipe for Carmelscotch Chocolate Cake (above), making an oblong loaf cake. Spread Nut-Fudge Frosting (p. 18) on top and sides. CHOCOLATE ICICLE CAKE: Glamorous two-layer “party” cake from the same basic recipe. Looks dramatic, is easy to make! Bake in moderate oven (350° F.) 25-30 min. Makes two 9″ round layers. Use recipe for Carmelscotch Chocolate Cake. Bake batter in 2 Sprycoated 9″ round layer pans 1 1/4″ deep. Spread Heavenly Frosting (p. 19) between layers and on sides and top of cake. Melt 1/2 oz. chocolate and 1/2 teaspoon Spry and cool, then dribble around rim of cake, letting “icicles” of chocolate trickle down the sides.